The USS MASSACHUSETTS was one of the newest American battleships in 1898. She was coaling at Guantanamo Bay and missed the Battle of Santiago on July 3. The USS MASSACHUSETTS was one of the new fleet of battleships promoted a special board created in 1890 to recommend the manner in which to update the U.S. Navy so that it could defend adequately against the imperial world powers, as well as by the nations of South America (several of which had larger vessels than any in the U.S. Navy). The board realized the need for battleships with a long-range cruising capability. However, many members of the United States Congress were in favor of Isolationism, and opposed long-range battleships as they were obviously not intended strictly for coastal defense. To assuage fears of the Isolationists, the new class of vessels were called "Sea-going coast-line Battleships". The name, an all- covering oxymoron, was thought to be particularly brilliant and useful by Theodore Roosevelt after he became Assistant Secretary of the U.S. Navy. Three ships were authorized for construction, INDIANA BB-1, MASSACHUSETTS BB-2, and OREGON BB-3, making the MASSACHUSETTS one of the United States' first true battleships. The three ships were authorized on June 30, 1890. On March 27,1898, USS MASSACHUSETTS was ordered to Hampton Roads, Virginia to join Commodore Schley's "Flying Squadron" which was being formed to protect the ports of the American east coast from the threat of Admiral Cervera's Spanish fleet. On May 13, she departed Norfolk for Cienfuegos, Cuba, where she took up blockade duties on the 22nd. Later that month she went to Santiago with the rest of Schley's force. On the afternoon of May 31st, along with USS IOWA and USS NEW ORLEANS, she bombarded the forts at the entrance to Santiago harbor and exchanged fire with Spanish cruiser CRISTOBAL COLON, forcing the enemy ship to retire to the inner harbor. MASSACHUSETTS remained on patrol off Santiago, intermittently bombarding Spanish fortifications, until July 3, when she departed to coal at Guantanamo Bay, missing the Battle of Santiago. She returned on the 4th, arriving in time to help USS TEXAS force the Spanish cruiser REINA MERCEDES to beach and surrender at midnight on July 6th. Following duty in support of the American occupation of Puerto Rico, from July 21st to August 1st, MASSACHUSETTS steamed for home, arriving at New York August 20th. 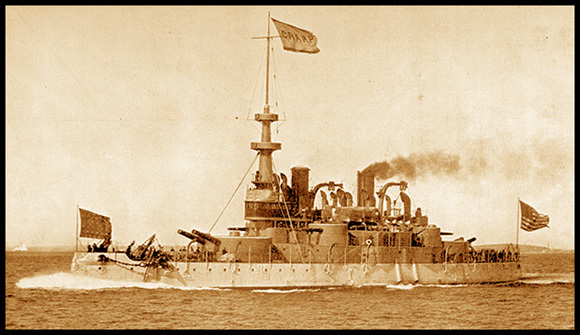 After the Spanish-American War, MASSACHUSETTS was used for training duties from 1904-1906 and decommissioned in January, 1906. She was refitted in 1909, and recommissioned in May, 1910 as training ship, being again decommissioned in May, 1914. MASSACHUSETTS was recommissioned as a gun training ship in June, 1917, and became a target ship late in World War I. She was decommissioned for the final time on March 31, 1919, stricken in November, 1920. Turned over to the War Department, MASSACHUSETTS was scuttled off Pensacola for use as artillery target in January, 1921. Her hulk returned to US Naval control in 1925 and was offered for sale as scrap. Oddly, there seems to have been no takers, even during World War II. The wreck became property of the State of Florida in 1956 and is now a state underwater archeological monument. One disadvantage of MASSACHUSETTS and her sisters was a relativly low freeboard, which made the guns difficult to operate in heavy seas. generating 11,111 hp. Twin screw. Gardiner, Robert, Ed., Conway's History of the Ship: Steam, Steel & Shellfire - The Steam Warship 1815-1905, (London: Conway Maritime Press Ltd., 1992). Reynolds, Francis J. The United States Navy, (New York: P. F. Collier & Son, 1918).